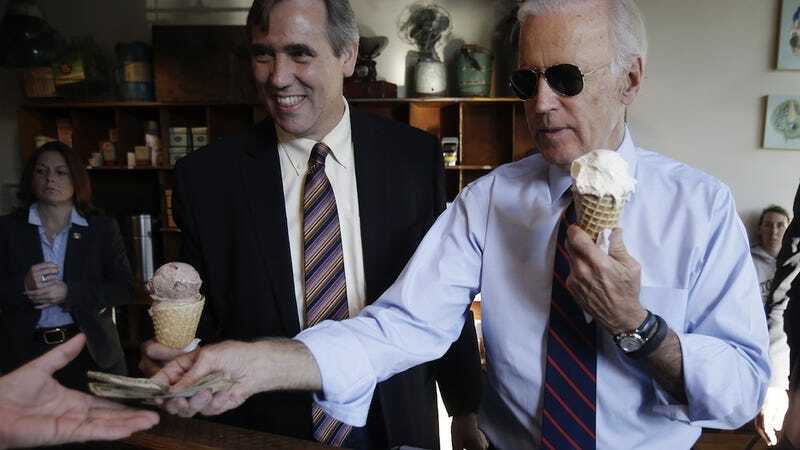 Joe Biden Eats an Ice Cream Cone While Wearing Aviators. Spectacular. Yesterday, Vice President Joe Biden bought himself an ice cream cone, which he proceeded to eat while wearing aviator sunglasses. Fortunately, an AP photographer was on hand to document this moment in American history. According to the Oregonian, Biden popped by Portland's Salt & Straw after a campaign rally for U.S. Senator Jeff Merkley. (He bought Merkley a cone, as well.) It's no surprise that Joe Biden is the kind of guy who suddenly turns to you and says, "Hey, kid, let's get some ice cream." (I assume he calls literally everyone kid, even people older than him.) Biden ordered scoops of Chocolate Woodblock and Double-Fold Vanilla. Man, I could really go for some ice cream.